When I was doing some research on toggles, I came across The Ship in a Bottle website and was pleased to find they sold hammock gear. I was intrigued by their unique and innovative hammock suspension system based on a military “Commando” or “Toggle Rope” design: the Toggle Rope hammock straps. At first I dismissed the design because I’m an advocate for using straps around trees to create anchor points (and to protect the bark). But the design was so interesting that I ended up buying a set to try them out. The customer service and shipping were excellent and I received my package in less than a week. Inside the box was a set of the toggle ropes and product sheet with step-by-step photos showing how to use the suspension system. The design is straightforward: a fixed eye loop on both ends of a long braided cord. In one eye is a tapered wooden dowel that serves as a toggle. The fixed eyes are tightly whipped. The toggle is notched, helping seat the cord securely. The “rope” is made from military 550 cord and uses a loose 4-strand round braid. This loose braid gives the rope dozens of attachment points and a lot of adjustability without any knots or extra hardware. My toggle set didn’t come with a stuff sack, but they do wrap and pack up into my hand, about the same size as the KAMMOK Python Straps I’ve tested. Using the Toggle Rope is pretty easy. It isn’t the quickest hammock suspension system, but it doesn’t complain or demand too much either. These straps are more then adequate to reach all but the longest of distances. I typically set up my hammock between 12 and 15 feet (4–4.5 m.) and I had to wrap the suspension multiple times around the tree in order to eat up the extra length. I also tried doubling up the rope first (fold it in half) and then loop it through itself. This second method worked great. The toggle end feeds through the eye to secure the rope around the tree, and then continues to the hammock. I feed the toggle through the hammock’s end loop (or steel hook, or carabiner, or descender ring, etc.) and then back to the braided rope. I open up the weave of the braid (splitting the four strands into two on each side) and then slip the toggle through to secure. One downside of nylon is its high-memory stretch. 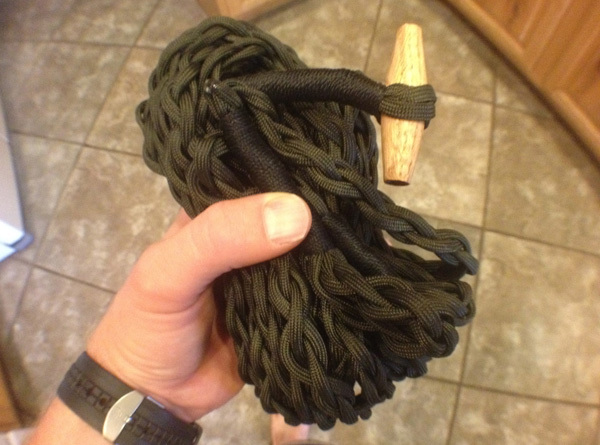 Military 550 cord, used in the Toggle Rope, is designed to have some stretch. When I measured the Toggle Rope, it had a relaxed length of 135 in. (343 cm. or just over 11 ft./3.4 m.). I could easily pull an extra few inches of slack, which is coming from the loose braid. At home, I used the straps doubled up on themselves. Once the suspension “set,” I didn’t have any stretching problems through the night. In fact, when I got out in the morning, the hammock seemed to be in the same height off the floor. I was encouraged and surprised. On a separate test outside, I only used a single length to the hammock. There was as little more stretch, so I put the toggle up higher on the braid. Once the rope is set, I didn’t notice any further stretching. One thing I noticed is that there is no clear water break between the suspension and the hammock unless you use some kind of hardware device like a descender ring, clip, or carabiner. I’m sure the weave helps with the stretching, but I’ll need some more time to see if these straps compress and stretch more when wet, for example. The really great thing about this suspension is the nearly unlimited adjustability thanks to the toggle and weave design. I can literally set the toggle anywhere along the rope, much like I would if I were tying a Marlinspike Hitch. The difference, however, is that no length is lost in tying a knot. A Marlinspike Hitch, popular with hammock campers, requires a minimum length of webbing in order to tie the knot, so it has some limitations. The Toggle Rope, in contrast, can link to itself at any turn of the braid. Pretty inginious. The only downside I see is the environmental impact. The weave does give a unique undulating pressure footprint, and when taut, compresses to about 0.5 in. wide (1.3 cm. ), but this isn’t a lot of width. By comparison, the the Python Strap is 0.75 in. (2 cm.) wide. Arguably, the most common strap width is 1 in. (2.5 cm.). These Toggle Ropes are wider than the stock ropes that come with most hammocks, but not by much. Wrapping the woven rope multiple times around the tree helps, and doubling the rope (basically tying a Lark’s Head knot around the tree) distributes the load even better. Once I got to handle the Toggle Rope, I couldn’t help but feel some nostalgia and I’ve grown to like them, if just for sentimental reasons. You see, when I was a Boy Scout, I made my own Commando Rope (even made my own sisal rope) to pass off requirements for the Pioneering Merit Badge. My friends and I had a lot of fun adventures using the ropes to climb around boulders, lasso imaginary creates, and just “look the part” of an adventurer with our Commando Rope wrapped around our shoulders. Once I figured out how the Toggle Rope suspension was braided, I started playing with my own design, trying different 4-strand and 6-strand flat weaves to see if a portion of the rope could be flattened to make it more “strap like.” In the end, I believe it is possible and I think this modification would make The Ship in the Bottle Toggle Rope suspension a solid competitor for hammock camping suspension. I wonder if you could make this with Amsteel? I thought about that too. However, Amsteel has such a great weight-to-strength ratio that it sort of defeats the purpose. If you use smaller Amsteel, like Zing-it or even Dynaglide, the diameter is so small that to braid/weave to an appropriate thickness to distribute the weight around the tree, you’d end up using a lot of cord. Another line I was looking at is Dacron. This polyester line doesn’t stretch, it’s UV-resistant, and is rated at 250+ lbs (113+ kg). Doing a 4-strand weave with Dacron would be a great alternative to 550 cord. Have you used this suspension system much since your review? I find it intriguing. Also, did you find a good method for your own braid? I have a bunch of paracord that I’ve purchased for scout crafts. I’ve also wondered about the other types of polyester ropes I can get at the hardware store to try in place of the paracord. If I wanted to go crazy, I have a big spool of sisal twine I could use to make ropes to braid. I did say crazy though. There’s a fair bit of work to that and I’m not sure I’d trust the end result. But I’ve always enjoyed the pioneering stuff since our troop worked on the MB so many years ago. I’m quite comfortable with knots and ropes. Probably more so than with figuring out all of the various pieces of hardware available. Plus, ropes are less expensive than all the gadgets. I’m still getting started and I have three kids interested in this too. I like the method they use on their website and other similar wraps for distributing the load on the tree. It does make me wonder if it’s better to stack the passes side-by-side or spread several inches apart. It seems side-by-side would be similar to using a strap. Yes! 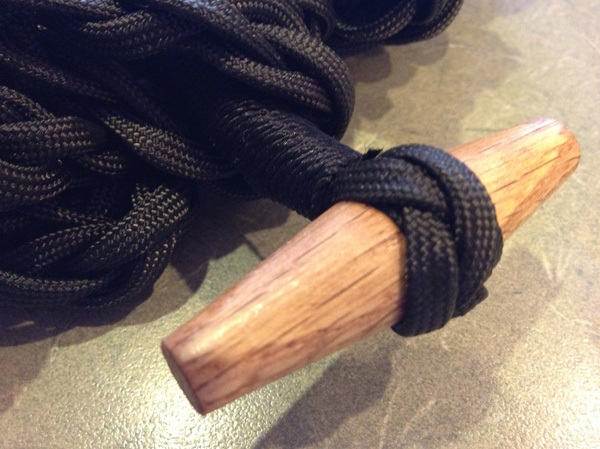 In fact, this summer at Boy Scout camp, our troop made several toggle ropes with paracord. It was lots of fun. I think making a version with sisal would be interesting, but I don’t think it would work well because the sisal twine isn’t braided, so the individual strands would be liable to splitting when you opened up the braid to toggle.